James MacMaster - After a winter gale, Leven Sands, Fife, Scotland. - Online gallery supplying original fine art. Trending Modern British and Contemporary Welsh. 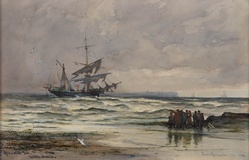 Available for sale from Big Sky Fine Art; this original painting by James MacMaster dates from around 1890.<br> The watercolour is presented and supplied in a sympathetic contemporary frame, mounted using conservation materials and behind glass.<br> The watercolour is signed lower right and titled lower left.<br> <br> James MacMaster was a Glasgow artist. He worked mainly in watercolour, but also in oils. His subjects were landscapes, coastal scenes and seascapes.<br> <br> Brought up in Glasgow, he lived at St. Monans, Fife in 1890, moved to Ayr in about 1895. 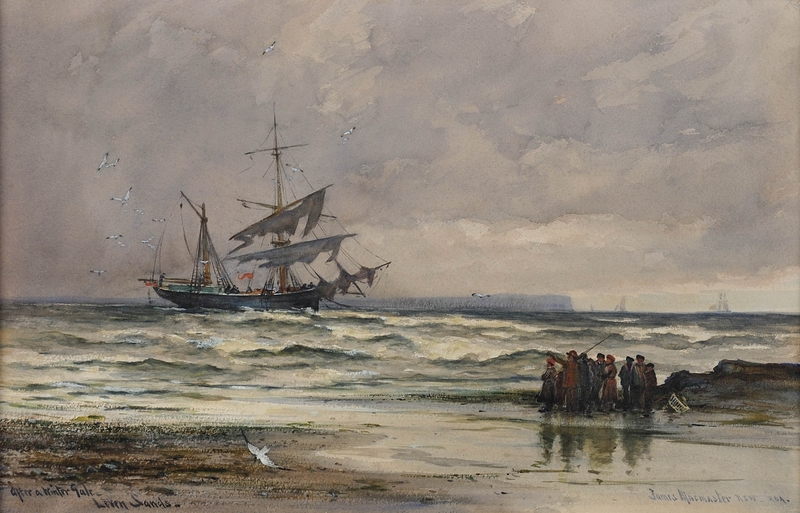 He painted mostly Highland views and coastal scenes using the “wet” technique in watercolour in a manner reminiscent of Clouston Young. He visited Holland, and painted some Dutch coastal scenes too, and was influenced by the Hague School of painting, which was reflected in his subtle palette. <br> <br> MacMaster was elected to membership of the Royal Scottish Society of Painters in Watercolour in 1885, and the Royal Society of British Artist in 1890. He exhibited widely in principal galleries and exhibitions in Edinburgh and London, including eight works at the Royal Academy between 1885-1897.<br> <br> He died in 1913.<br> <br> Today his works are represented in the Glasgow Art Gallery and the Paisley Art Gallery.<br> <br> This original watercolour painting of Leven Sands, Fife on the east coast of Scotland. There has been a winter gale, and the ship in the centre of the painting has clearly taken a battering. Her two masts are still upright, but the sails and rigging looks torn and in disarray. The is a small red flag flying from the deck and we can see that there are several members of the crew safe on deck. Back on the shoreline there is a single seagull flying low over the beach, and a group of about ten people huddled together surveying the ship and no doubt making plans about how best to assist. Although the gale has passed the people are well wrapped up, the sea looks choppy and the sky is still somewhat foreboding, with heavy cloud. There is the faint outline of other ships on the horizon and the outline of cliffs in the distance. <br> <br> Today Leven Sands is an area of industrial heritage, with views across the Firth of Forth. The Fife Coastal Path passes near the beach. Available for sale from Big Sky Fine Art; this original painting by James MacMaster dates from around 1890. The watercolour is signed lower right and titled lower left. James MacMaster was a Glasgow artist. He worked mainly in watercolour, but also in oils. His subjects were landscapes, coastal scenes and seascapes. Brought up in Glasgow, he lived at St. Monans, Fife in 1890, moved to Ayr in about 1895. He painted mostly Highland views and coastal scenes using the “wet” technique in watercolour in a manner reminiscent of Clouston Young. He visited Holland, and painted some Dutch coastal scenes too, and was influenced by the Hague School of painting, which was reflected in his subtle palette. MacMaster was elected to membership of the Royal Scottish Society of Painters in Watercolour in 1885, and the Royal Society of British Artist in 1890. He exhibited widely in principal galleries and exhibitions in Edinburgh and London, including eight works at the Royal Academy between 1885-1897. Today his works are represented in the Glasgow Art Gallery and the Paisley Art Gallery. This original watercolour painting of Leven Sands, Fife on the east coast of Scotland. There has been a winter gale, and the ship in the centre of the painting has clearly taken a battering. Her two masts are still upright, but the sails and rigging looks torn and in disarray. The is a small red flag flying from the deck and we can see that there are several members of the crew safe on deck. Back on the shoreline there is a single seagull flying low over the beach, and a group of about ten people huddled together surveying the ship and no doubt making plans about how best to assist. Although the gale has passed the people are well wrapped up, the sea looks choppy and the sky is still somewhat foreboding, with heavy cloud. There is the faint outline of other ships on the horizon and the outline of cliffs in the distance. Today Leven Sands is an area of industrial heritage, with views across the Firth of Forth. The Fife Coastal Path passes near the beach.